How many times have we seen that? 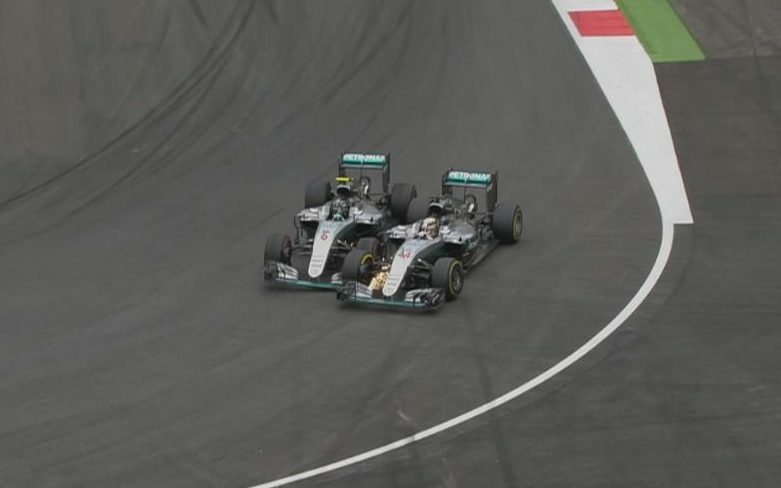 Senna vs Prost, Prost vs Mansell, Mansell vs Piquet, Alonso vs Hamilton and now Hamilton vs Rosberg … Are we surprised? Not at all! In motor sport, a driver’s number one enemy is his own teammate and this announced rivalry often offers great on track fighting and debatable episodes of sporting cavalry. Why should we change these fascinating flashes of great racing challenges by imposing team orders? What a stupid dictatorial way to prevent entertainment; “you can fight, but without touching” as if a boxer could win a bout by simply telling his challenger off. Let them be racers, let them friction their wheels, let them destroy their locker rooms in rage and lie to the media when they address each other, let them fight … They know what’s at stake, they know what it means to stand on the highest step of the podium looking down at your destroyed team mate … they live by that. Let them be heroes, they love it, we love it!